Strong Industries offers excellent pool and spa water purification products. Strong Industries offers excellent pool and spa water purification products. Filters compatible to this brand, along with many other brands, are available through the Filters Fast website. 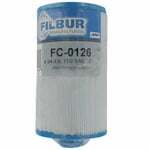 The Filbur FC-0131 Pool and Spa Filter replaces OEM part number 20254-238, Unicel 4CH-24 and Pleatco PTL 20HS. The Filbur FC-0126 Pool and Spa Filter replaces the OEM part number PSANT20 in Strong Industries Antiqua spas. The Strong Industries - PSANT20 Comp Pool & Spa Filter is a pool filter cartridge measuring 4 3/4" in diameter x 8" in length. 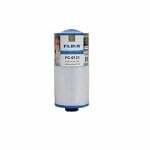 This compatible Strong Industries filter replacement has a closed top hole with a Crescent Handle top style, and a 1 1/2"
The Pleatco PSANT20-P4 compatible pool and spa water filter cartridge is made of a highly efficient spun bounded polyester material. The Reemay pleated media is fused to antimicrobial endcaps that resist the growth of bacteria and odor.